An asset to sales ratio is one of the primary ratios which are used in determining the company’s efficiency. It shows how a company is generating revenue by managing its asset and correlation between them. A higher asset to revenue ratio indicates higher profitability with low investment. Average total assets are taken into account as because most of the companies choose for capital investment during the year and to take a median of assets utilized for generating the entire revenue throughout the year average of opening and closing total assets are taken into account. Assets can be built by means of shareholders equity and as well as borrowed fund. So summation of both borrowed amount and shareholders fund are taken into consideration for the base when the business revenue is determined. X Ltd. has a closing Asset in its Balance Sheet at INR 20000 and its opening balance stands at INR 16000. Revenue stands at INR 12000. Find the Asset to Revenue of the Business? To conclude for every 1 rupee Investment, the company is able to generate 0.66 or 66% of the total investment. The Consolidated income of Nocil Ltd for FY17 and FY18 are INR 751.73 Cr and INR 982.19 Cr respectively, whereas the Total Asset of the company during these periods stood at INR 1,160.94 Cr and INR 1,347.69 Cr. respectively. Find the asset to Sales of the company for FY18. Total Asset of the company at the end (closing balance) of the year INR 1,347.69 Cr. Thus to conclude the company generates 78 paisa for every INR investment into the company. The Consolidated Income of Sunteck Realty Ltd for FY17 and FY18 is INR 960.36 Cr and INR 897.56 Cr respectively, whereas the Total Asset of the company during these periods stood at INR 3678.62 Cr and INR 3656.33 Cr. respectively. Find the asset to Sales of the company for FY18. Total Asset of the company at the end (closing balance) of the year INR 3656.33 Cr. Average total asset of Sunteck Realty Ltd = INR 3667.475 Cr. Thus to conclude the company generates 24 paisa for every INR investment into the company. 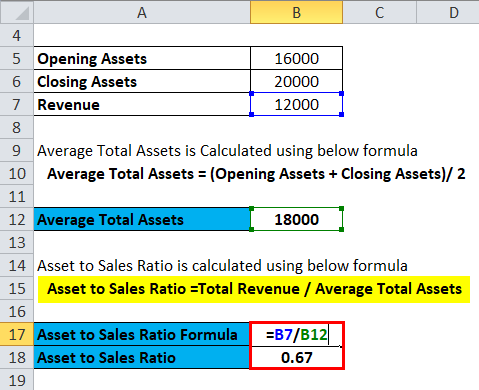 This Asset to Sales Ratio formula measures the efficiency of the particular company in terms the operating performance. The amount of Revenue generating from its existing assets is an Indicator of the health of the Business. Commonly it is used in case of peer analysis of different companies within the same sector. The higher the ratio, the better the operating efficiency of the management. Higher Revenue denotes better product acceptability and better competitive advantage of the business compared with its competitors. The Management of the business would get to know about the primary operating assets and they would probably concentrate on Restructuring by means of Asset Sales to improve the ratio and as well as lower Cost of borrowings(In case the Assets are purchased on behalf of Borrowed capital), several expenses like Depreciation, maintenance expense, servicing expense etc. 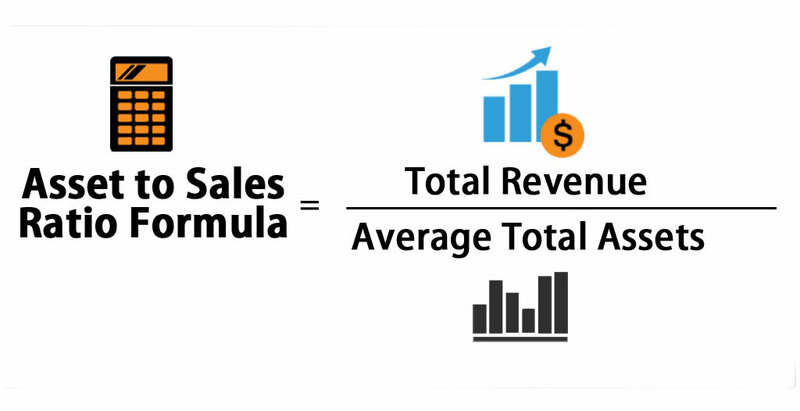 The day’s sales to Revenue shows how quickly the stock of a particular business is churning or in other words what is the demand of the product? The Creditors, the Loan provider or the Financial Institution who are associated with the company would be able to know about the manufacturing status and the capacity utilization of the particular Business and get to know about the financial health of the Company. The management would be able to forecast the current scenario, expected strategies and last but not the least they would be able to communicate with the third parties with the Sales Figure and the Capacity addition. A company has to incur several expenses on its assets such as maintenance cost, depreciation, repayment costs etc. So if a company has a lower Asset to Sales ratio, and the ratio is dropping with every financial year, then the company has to restructure its operating Assets so as to narrow its costs and improve margin. Sell of unwanted assets would lower the denominator of the ratio and the Asset to Sales figure would look healthy. Analysts pay utmost attention to this particular ratio before they recommend the stock for buying for the Investors. This is one of the primary criteria (based on the specific industry) to determine the competitiveness of a business. The diminishing Asset to Sales ratio indicates low business viability and low competence of the management. 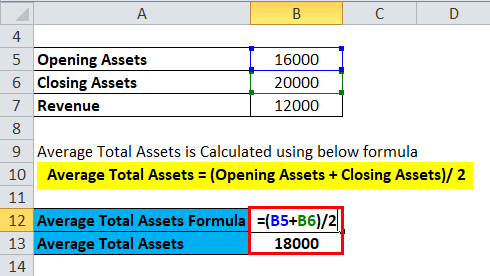 You can easily calculate the Asset to Sales Ratio using Formula in the template provided.